Douglas Sirk`s All I Desire begins with Lily Murdoch (Lori Nelson) who is looking forward to her biggest night ever, where she will be performing on the stage, as her mother Naomi used to do. Despite Lily`s great excitement, she keeps it secret from her family that she has sent out a letter inviting her mother to attend her play. By the time her mother, Naomi, finishes reading the letter, she has no doubt that this is a day she has longed to see and has absolutely no intention of missing it. As the film progresses, we find Naomi back in the small town, with a population of only five thousand. Even though her reputation precedes her, Naomi feels comfortable being back in a place that she never wanted to live. Her high expectations end though as soon as she enters the house, where her children, and husband live; only her daughter Lily and a servant welcome her warmly, while her husband and her children treat her with indifference. All I Desire is one of Stanwyck’s mature films, where she had actually reached the age where she felt comfortable playing a troubled women. 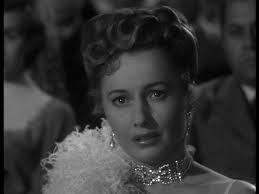 Sirk, who had directed her before, knew that he certainly could trust such a role to Stanwyck. Despite the running time of the film, which is only one hour and twenty minutes, the film leaves no questions or doubts as to what the ending will be, and gives the audience everything they desire. In conclusion, All I Desire is one of those films that talks about old conflicts and the aftermath of those conflicts and how only strong and determined people, who can face them, can overcome the poor results. It also shows us that sometimes some dreams must be left as dreams and should not be chased at all, because that which you long for can take away everything you love and value so much. It`s certainly a memorable film and is well deserving of a place in film history, as the subject of ‘what we want’ and ‘what we get in return’ will always be open and argued about for generations to come.